Today is the much anticipated public release of the Blackberry Playbook. And as we were told during our coverage of the media event in NYC on April 14th, the Blackberry Bridge was also enabled in the AppWorld. 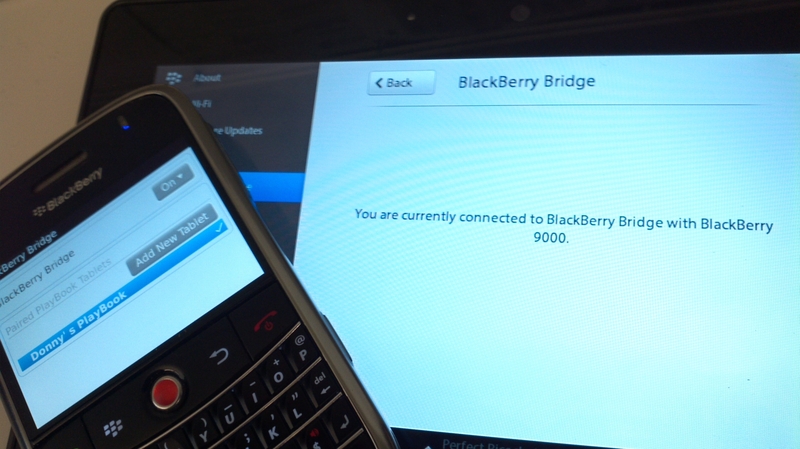 Today I’ve had the opportunity to examine the Blackberry Bridge connectivity with my Bold 9000 running OS 5.0.0.900. After successfully installing the BB Bridge app from the AppWorld, I was able to connect my Playbook and BB9000 without a hitch. With the Bridge’s minimun requirement being at least BB Version 5.0, I was able to use an old Blackberry Bold for testing. With a very slight lag due to bluetooth connectivity, everything else was working perfectly. Access to your Blackberry device’s apps such as Messages (emails), Contacts, Bridge Browser, Calendar, MemoPad, Tasks, and BridgeFiles were flawless. I was somewhat disappointed as I was expecting FULL access to all my apps including BBM and text messages, but I guess I can’t ask for too much. 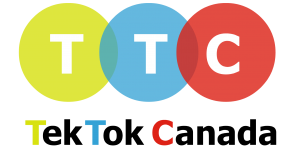 The 7 new icons under the new heading ‘Blackberry Bridge’ are all synchronized with the connected unit to the Playbook. The ‘Messages’ icon grants access to all your email accounts which shows ALL emails by default. As shown in the image below, there is a drop-down arrow that allows you to specify the particular mailbox you’d like to view at any given time. 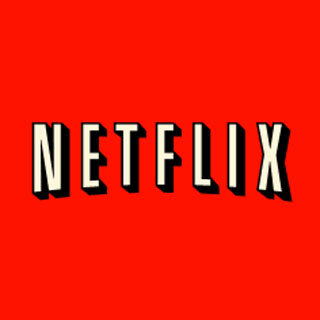 Bridge Browser: The Playbook itself has a native ‘Browser’ icon which is functional when connected to any hotspot whether it is via WiFi, Bluetooth, or USB connection. However, when you are Blackberry Bridge connected, this new icon is also present along with the native browser icon. I did not see any difference in functionality as they both work just fine when ‘bridged’. What makes it interesting is that the bookmarks are different from each other. Which gives the impression that they are both linking to two different sources. To put it to test, I added a new bookmark on my BB9000 while it was bridged, but the bookmarks never updated on the Playbook. Neither Bridge Browser nor the native browser on the Playbook reflected this change. A quick research online didn’t provide anything solid so I may have to get back to you on this topic as this develops, or if RIM decides to send out an official word on it. UPDATE: After many more connectivity issues including my PlayBook appearing to get stuck in a loop after initializing connection. I can confirm now that the Bridge Browser is the only browser that works when the Playbook is Bridge with a Blackberry smartphone. Because of this, the Facebook and Twitter apps installed on the local Playbook did work. I’m interested to know if anyone out there is able to access those apps so we can perhaps narrow down the reason why mine didn’t work. I’d like to say it’s the fact that I am using a BB 9000 running OS 5 but I doubt the software has anything to do with it this time. Bridge Files: Bridge Files is your typical Files Explorer found in your handset. The difference is that this only grants you access to your media card as opposed to also having access to the handset’s device memory folder. I tried taking photos while my two devices were bridged but it seems that the syncing still needs some polish as it didn’t take immediate effect as well. Perhaps I just needed to re-sync the devices by disconnecting and reconnecting the bridge…who knew it would do more harm than good? 1st crack at it: Three times today I needed to disconnect my bridge connection for different reasons. The 1st time I disconnected using my smartphone and highlighting the connection and selecting ‘disconnect’. Without reading any manuals or how to’s, this sounded about right. I came back thinking I can do the exact opposite and click ‘connect’. After displaying a successful connection I was disappointed to see that I was still unable to access my bridged files and my Blackberry Bridge icons were locked up. No matter what I did, reboot one, reboot the other, retry scanning the connection, manual connection, disconnecting and reconnecting… it just wouldn’t budge. Eventually, I rebooted both devices at the same time, and after retrying twice, it connected. The Second Time: After my painful experience this morning I had to disconnect again. Dreadful, I tried a different way. Still using the BB Smartphone, I went in to the Bridge app and instead of disconnecting and reconnecting, I decided to turn off Blackberry Bridge which then successfully disconnected. Upon my return, I was hopeful when I turned on my Blackberry Bridge. I was not disappointed! It opened fine, minus the fact that the icons were still locked even after showing successful connection but a quick launch of one of those locked apps immediately opened them ALL back up. Three’s a charm: With my tried and tested process in hand I was beyond confident in disconnecting the two for the 3rd time. I followed the same process when I tried to re-sync by disconnecting after taking the photo-test (as previously mentioned in this article). Same symptoms as above except now when I try to re-scan, manually connect, or simply re-connect the previous connection on the Playbook I get the message below. As I type this article, I continue to have troubles connecting the two. I’m sure after I write this and devote my time into reconnecting them, I can figure it out. And when I do find the sure-fire way to disconnect and reconnect, I’ll make sure to update this article. Overall, I am impressed with the Bridge feature for Blackberry devices. I was hoping that this will sway me into ditching my iPhone 4 and de-activating my 3G subscription for my iPad 2, but for now I think I’m staying put. 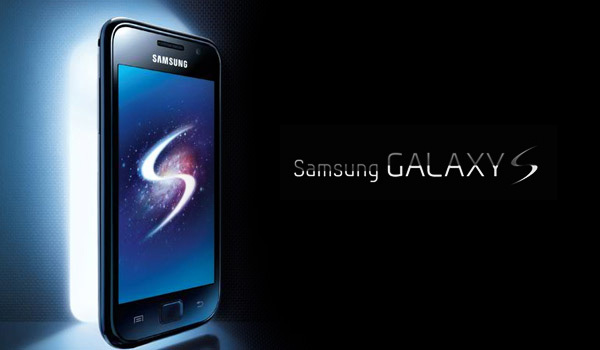 The QNX Operating System running this wonderful device is filled with potential. I can imagine the Playbook being as common as a Blackberry phone in the Enterprise world. But before that happens, RIM developers have a little bit of tweaking to do to ensure the connectivity is as stable as what RIM’s “Blackberry” stand for. I had no problem with running the Bridge all day with my Playbook and Blackberry Torch. It also is working perfect with my work emails as my Blackberry is on a BES. It also work’s perfect with my Work Calendar. So far I find the Bridge is working well with my Bold 9700 on OS 6.0. It was dead simple to install, though I knew from glancing at a website that I had to download direct to the Bold from the app store. All the features are there, including access to files on the Bold, so nice to have that access without any cables. No breaks in the bridge so far. The functionality seems limited however, no way to adjust or filter for categories for example, so I don’t know if this is going to get updated. I spent the whole day trying to connect my Playbook with my Bold 9700. Not one successful attempt. I tried to restart both devices, turned on & off the bluetooth, made sure both are discoverable, etc. My 9700 seems to be getting through to Playbook. It’s Playbook that can’t connect to my 9700. 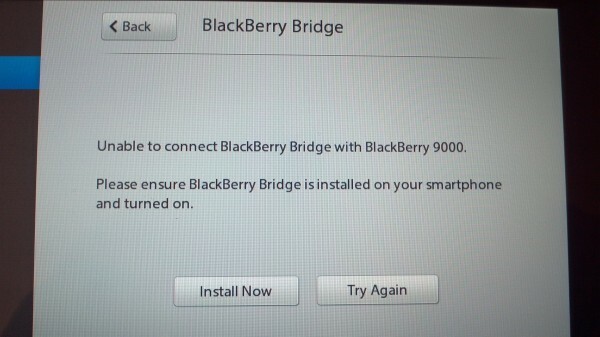 I get the same message “unable to connect BB Bridge with BB 9700”. I tried to send DM to blackberry help but have not heard back. Please share if you find the solution. Thanks for the update Ryan, nice to hear more good news coming from the RIM camp. Keep ’em coming! 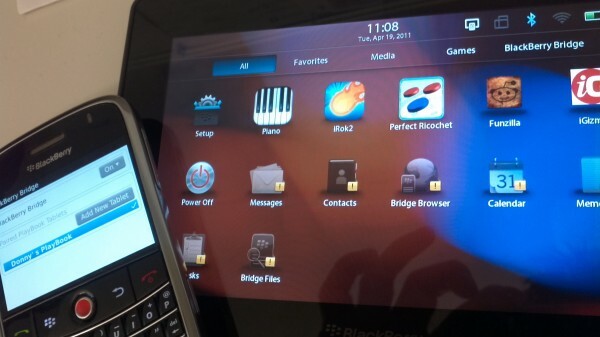 So far from my discussion with other Playbook owners, it appears that the BB version 5 maybe experiencing inconsistencies in relation to the bridge. Otherwise, I was able to successfully reconnect after removing the battery on my 9000 for a couple of minutes then restarting the linking process from the beginning. Daphne, for my Bold 9700 (on OS 6.0): during the overall setup on the Playbook it led me into the Bridge setup and when the screen came up to install Bridge into my smartphone, that’s when I went onto the App Store with the Bold to download the Bridge app. Once that was installed, as I recall, I continued with setup on the Playbook, and it showed a barcode screen. From the Bold, I clicked to add a device, and was then able to scan the barcode. In a second I had them connected, and it’s still working fine. ** The Bridge worked all the way across the house, ie. Bold was about 50 feet away, 2 floors down. You may want to try downloading Blackberry OS 6.0 on the Bold. I think you need to learn how to use software..It disconnects nicely and connect back too. If you say disconnect on Playbook showed on your BB..next time first say connect on playbook you would like to connect on BB and access your apps. its as easy it can be. Does Facebook and Twitter apps work through bridge connection ? 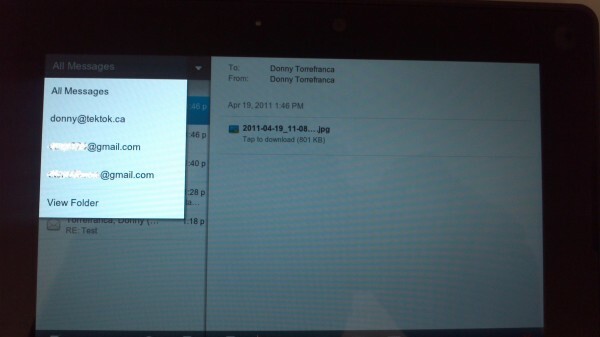 Yes it does… I had installed Facebook and Twitter on my Playbook prior to the Bridge being enabled in the AppWorld. It worked fine on regular WiFi and it also worked fine through the Bridge. 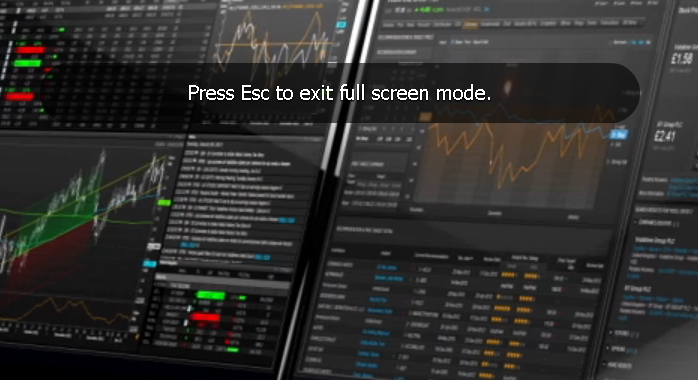 correction, it does not work when Bridged as it uses the native browser to load. You could manually enter the address using Bridge Browser but it defeats the purpose of the app icon. Not to hijack this threat at all but it sounds like Personal Hotspot on the Iphone is easier! Donny why do you still need 3G on your ipad when you can use Hotspot! I’m sure a wifi hotspot on the IP4 will eat battery MUCH faster than the bluetooth bridge on the BB. Would be great to see someone test a Bold 9780 (bluetooth) vs IP4 (wifi) for battery life for browsing. That’s a very good, and valid question… I like convenience. Before my 3G ipad2 I had a wifi-only ipad2. Strictly for convenience of being able to pull out the iPad and use it without the need to turn on hotspot and make sure they’re connected before getting started. Not to mentionaking sure both iPad and iPhone have enough power to supplement my browsing (and blogging) needs. what about the memory drain issue when bridging? coz as we know, bold 9000 has a very low free memory. using playbook with a bold 9000 on os 5.0. i’ve been using wifi for a few weeks before i connected the bold and i’ve been very impressed with its UI and preformance. seems that the problems i have had with the bridge come from the lack of cpu (600mhz) and ram 265mb) on my phone. i also suspect the os 5 may not be as functional with the bridge as well. waiting for the new torch or bold to see if the bridge preformance increases with the new hardware. i also hope the next update brings some powerful new features. would love to see the full potential of the two devices come together. i.e take calls on the playbooks, seamless access of music and pictures on the phone to playbook native apps and bridging to cars to do the same. QNX is powerful stuff. they are already looking into linking phones music and internet access to car dash systems so lets step it up in the playbook intergration.